The roots of the festival go back 51 years ago when a small art and craft show was held on beautiful Victoria Beach for Canada Day in 1967. The event included a fireworks display put on by local firefighters to celebrate Canada's Centennial. 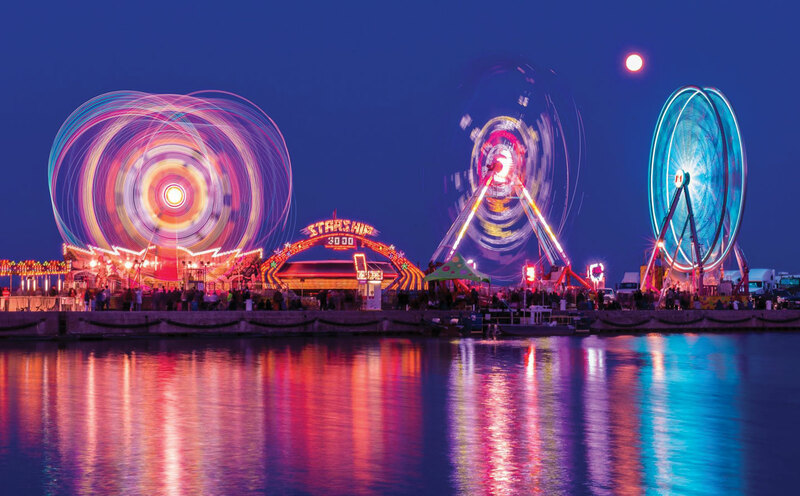 In 1987 the Cobourg Waterfront Festival was formally launched when the Cobourg Rotary Club and the Cobourg Lions Club became involved along with a volunteer committee of town citizens. Now, 31 years later, the Festival has become one of the largest summer festivals in Ontario, attracting tens of thousands of people to the community over the Canada Day long weekend. Watch here for 2018 Festival Guide when it becomes available. We hope you'll visit us in 2018. While here, take some time to stroll downtown (just two blocks away) and visit our many shops and restaurants. Our magnificent town hall (shown above in a photo by Jean Simard), Victoria Hall, is a must-see. We think you'll be impressed. Who knows... maybe you'll become one of the visitors to the festival who decides to set down roots in our extraordinary community. Strawberry Social - Northumberland United Way Fundraiser 4:30 p.m.–6:30 p.m. Craft Beer & Entertainment - Madman's Window - inside the tent 7:00 p.m.–10:00 p.m.
Grape Lady Falls 12:00 noon–1:30 p.m.
Marty & the MoJos 2:00 p.m.–3:30 p.m.
Stone House 4:00 p.m.–5:30 p.m.
AC/DC Canada - Tribute Band 8:00 p.m.–10:00 p.m.
Upper Canada Axe Throwing - try your axe throwing skills - by donation 10:00 a.m.–6:00 p.m. The Lumber Company Lumberjack Show - with audience participation 2:00 p.m. to 2:30 p.m. Opening Ceremonies and Birthday Cupcakes with special guest Magician David Johnson 2:00 p.m.
Fireworks over Cobourg's Heritage Harbour 10:00 p.m.
Joyful Noise 11:00 a.m.–1:00 p.m. The Spirits 1:30 p.m.–3:30 p.m.
Urban Angel 3:00 p.m.–6:00 p.m.